I was listening to the local Catholic radio station while driving my son to school this morning. The station, Relevant Radio, has a program called "Morning Air" hosted by Sean Herriott. This morning Sean was discussing keeping the Triduum holy with guest and AOL ParentDish blogger Rachel Campos Duffy. One of Rachel's suggestions was to take your children out of school on Thursday (and Friday, if they don't have that off) and do some activities with them to reinforce the holiness and specialness of those days. In other words, we might need to isolate ourselves from the secular world to make the Triduum meaningful. Although I have more flexibility with my daughter, whom I homeschool, I'm stuck a bit with my son's schedule. My son will be missing three days of school next week so I really shouldn't take him out this week. Our schedule is pretty full with sports activities for the next few days. As much as I wish we could skip them, it isn't realistic since my husband is the coach for one of the teams. In addition, we both have the philosophy that if a person commits to a sports team, he has a responsibility to his team and coach to attend practices and games as much as possible. The church near us has Perpetual Adoration Chapel. It's a very special place for us. My son and I were regular adorers when he was in kindergarten, but unfortunately we haven't been able to do this for several years. On Friday morning, instead of sleeping in on this "no school" day, I'll get the kids up and we will spend some time with Jesus in the Blessed Sacrament during a time that I know there are no other adorers. We will pray the rosary together, spend time in silent prayer and I'll just encourage them to "talk with Jesus." We are slowly building up a library of beautiful picture books related to the Triduum and Easter. I'll allow each kid to pick out a book and we will cuddle up and read them each night. Some of our favorite books include. A gentle portrayal of Jesus' death and resurrection, as told from the point of view of the animals in the garden. Beautiful full-color illustrations in this book! This book also has beautiful illustrations. In it, a girl learns how a sand dollar illustrates the story of Jesus death and resurrection. 3) Attend as many Triduum services as possible. For Holy Thursday, we like to watch a movie called The Last Supper by Mirkam Productions. Filmed in the Holy Land, it explains the origins of The Last Supper and how a Jewish family would prepare a Seder meal. There you have it, my scaled-down plans for this year's Triduum. If our plans change (i.e., sports and other activities are canceled!) I'll add a few other activities. I will try not to feel guilty because I can't fill our days with meaningful religious activities. Instead, I'll just try to grab a moment here and there to remember and thank Jesus for what He did for us. And I'll try to remember that despite what's happening in our lives, I can always turn my attention toward God by silently praying The Jesus Prayer*. I love the fact that the prayer can be said unceasingly while I clean, bake or do other necessary chores in preparation for Easter! Have mercy on me, a sinner"
2667 This simple invocation of faith developed in the tradition of prayer under many forms in East and West. The most usual formulation, transmitted by the spiritual writers of the Sinai, Syria, and Mt. Athos, is the invocation, "Lord Jesus Christ, Son of God, have mercy on us sinners." It combines the Christological hymn of Philippians 2:6-11 with the cry of the publican and the blind men begging for light.18 By it the heart is opened to human wretchedness and the Savior's mercy. 2668 The invocation of the holy name of Jesus is the simplest way of praying always. When the holy name is repeated often by a humbly attentive heart, the prayer is not lost by heaping up empty phrases,19 but holds fast to the word and "brings forth fruit with patience. "20 This prayer is possible "at all times" because it is not one occupation among others but the only occupation: that of loving God, which animates and transfigures every action in Christ Jesus. Hi Cheryl, what a great idea about pulling your kids out of school on Holy Thursday and Good Friday. 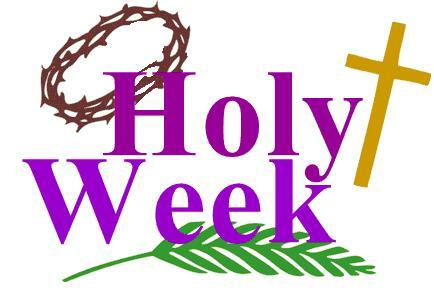 Fortunately, my son had the day off of school on Good Friday but he was at school on Holy Thursday. In fact, we missed our church service that night because of a conflicting school event that same evening. I was running the Ice Cream Social part of the event so I felt I couldn't back out... perhaps I should have and honored Jesus instead. It's hard making those calls but it sounds like you're doing a wonderful job in keeping the focus on Jesus with your activies.